If only The Finest Hours had as much drama and punch as its poster suggests. It's odd that in a disaster movie, most of the characters don't have much to do. Chris Pine, when not looking sheepish, is shown multiple times pushing the throttle forward on Coast Guard Motor Lifeboat CG 36500, or pulling it back. And lots of times, he has gale-force winds blowing snow and surf into his eyes, but he still manages to look mostly sheepish and otherwise unaffected. 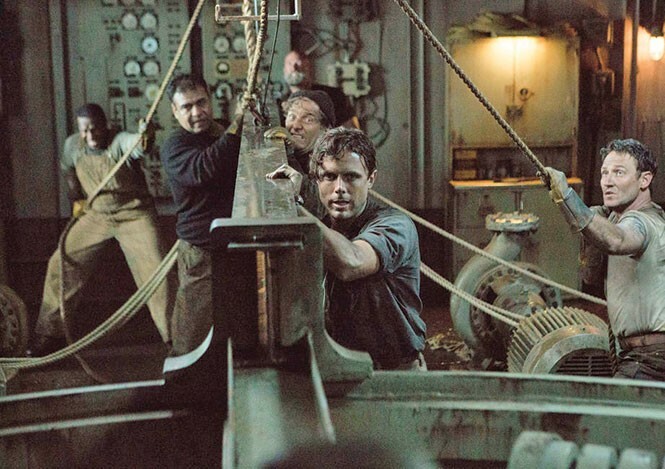 This is just a guess, but the real-life rescue of the men trapped aboard the SS Pendleton, an oil tanker that was ripped in half during a terrible storm in 1952, was probably much, much more difficult than it seems in director Craig Gillespie's The Finest Hours. Disney has made a family-friendly movie that treats its characters with respect, but anything in the script resembling grit or rough edges has been sanded away by the Disney Machine. You know the Disney Machine, right? It's that thing that takes an intriguing premise—say, the rescue of 34 men trapped on a sinking oil tanker in rough, storm-tossed seas off Chatham, Mass., in the middle of a hard winter—and removes most traces of human emotion so that each character is whittled down to his barest and most inoffensive essentials. In this case, there's Coast Guard Boatswain's Mate 1st Class Bernie Webber (Pine), the stoic rule-follower who decides not to follow the rules. He will rescue those guys! There's Seaman Richie Livesey (Ben Foster, who deserves better), the stoic contrarian who decides to help Bernie with the rescue. They will get it done! There's Ray Sibert (Casey Affleck, who does more than the part deserves), the Pendleton's engineer who reluctantly assumes control of the tanker. He's not going to let his shipmates die! You get the idea. These aren't characters. They're archetypes, and the screenplay doesn't let them develop beyond archetypes. That's a pity, because Gillespie doesn't inject any sense of struggle or daring or danger into what, in real life, must have been a huge struggle, impossibly daring, and unfathomably dangerous. For example, the first impossible task Bernie and Richie encounter is getting their lifeboat across Chatham's bar in a horrendous nor'easter—the kind of weather system that rains and snows and blows with such ferocity that most of the rest of the country calls these storms blizzards. Every character—and I mean every character—says, "You can't get across that bar." (Except this is Massachusetts, so they say "bah.") Even inexperienced engineer Andy Fitzgerald (Kyle Gallner) and Ervin Make (John Magaro), also aboard the lifeboat, agree. But then they get across the bar, and seemingly easily. Sure, waves crash down on the boat and submerge it, and Carter Burwell's score swells appropriately, but then the boat surfaces, Pine's hair looks pretty good, and along they go. There's next to no talk of hypothermia, illness, drowning or seasickness in a place where that is almost certainly a serious concern. Even the one on-screen death in The Finest Hours is surprisingly peaceful-looking. It's unreasonable to assume that a movie with the Disney logo displayed so prominently on the poster would be tough-minded or relentless or give its characters flaws. Disney used to make movies with teeth (Something Wicked This Way Comes; The Black Cauldron). Now they don't. That isn't a problem when the result is something like Miracle. Unfortunately, most Disney movies now resemble Million Dollar Arm (also directed by Gillespie), Tomorrowland or Cinderella: Tasteful, unironic, dull. Amid the humdrum masquerading as high drama are a couple nifty touches. For once on film, the Massachusetts accents are downplayed. Pine's is good, as is Foster's (he's from Boston originally). Affleck leaves his elsewhere and sticks with his trademark mumble (it works). There's also a solid role for Holliday Grainger as Miriam, Bernie's fiancée. In most movies like this, the women have little to do but sit around and look concerned. Miriam is tough, self-possessed and resilient. She asks Bernie to marry her (unheard of in 1952). When she learns that Bernie's commander (Eric Bana) is sending him out in the terrible storm, she demands, calmly, that he call off the rescue. "Please bring them back," she says, over and over, with increasing urgency, her eyes welling with tears. It's a human moment in a movie that's trying very hard to humanize characters that don't register as human. They're human-like, but in the end, the screenplay goes where it goes and the people are incidental.